Merry Christmas from Walt Disney World! As you can see, we have been having a lot of fun in Disney World with Chet's family for Christmas. So much fun that we have been too tired at night to post on pictures! (Sorry Nan and Nana!) We'll try to make up with several posts after we get home on Saturday. In the meantime, here are some highlights from our trip. Hannah is showing off her "Mommy Original" while waiting to listen to the a cappella group, Voices of Liberty. All of the singers in that group know who we are and love when Hannah comes to see them. Hannah and her cousin, Maddyn, chit-chatting while they were waiting for the big kids to finish riding Big Thunder Mountain. The girls have had a lot of fun together! Hannah and cousins, Jessica and Kayden waiting for the Candlelight Processional to start. Every year, Epcot invites celebrities in to read the birth of Jesus from Luke accompanied by an orchestra and mass choir. We got to hear Stephen Curtis Chapman. It is an amazing experience especially when you consider that you are in the middle of a theme park! Maddyn and Hannah showing off their matching Disney dresses. We had Christmas breakfast with Mickey and friends and Chef Mickey's. As usual, Hannah loved the characters and even let Mickey wipe her mouth (she fights me when I try to clean it!). Mickey came by at one point, surprising and tickling her! Hannah tells Daddy that she does not care to be tickled right now. 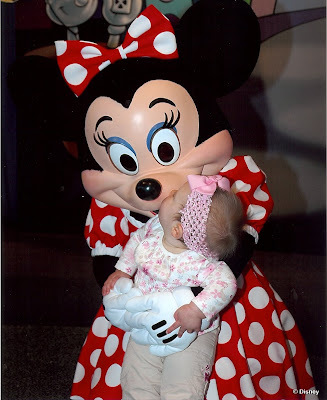 This is one of the pictures that Disney's professional photographers took on our last trip to WDW. Hannah loves playing with the characters especially Mickey and Minnie. She gets so excited when we go to see them! On this particular day, she and Mickey "danced" together. Pluto was down on all fours crawling around with her and Hannah and Donald Duck just hung out together. We'll share more pictures from this day when we get them in from Disney. This is one that we had printed in Disney for free! We are getting ready to go down there again, this time with Chet's family for Christmas. I'm sure we'll get many more great photos to share! Have a wonderful week!